This week the theme of TAY is music in games and not just game music you like but how music shaped your gameplay experience. There are numerous themes that come to mind when I think of my favorite games but it’s almost always comes back to the Final Fantasy (FF) series. Yes that opening is the same as my last post because that is the point of this theme right lol. I wasn’t going to do a post on Final Fantasy 8 but after going back through the OST I decided I wanted to do it anyway. Eat your heart out Z :p. This game features more musical greatness from Nobuo Uematsu so lets get started. Final Fantasy 8 was originally released in 1999 and was my introduction to the Final Fantasy franchise as well as JRPGs as a whole. I was around 12 years old when it came out and I remember watching the commercial during MTV. Funny enough I don’t remember the voice over but I figure you guys would get a kick out of it. Fast forward to Christmas of 1999, I begged my mom for this game and there it was sitting happily under the tree. I opened it and my sisters and I were enveloped in the world starting from the opening cinematic. It had the elements of the commercial and so much more. There were so many feathers and Squall, tall, dark and broody, was the man of my dreams. The opening song is called Liberi Fatali and it is, hands down, one of the best openings ever. Period. Non negotiable lol. 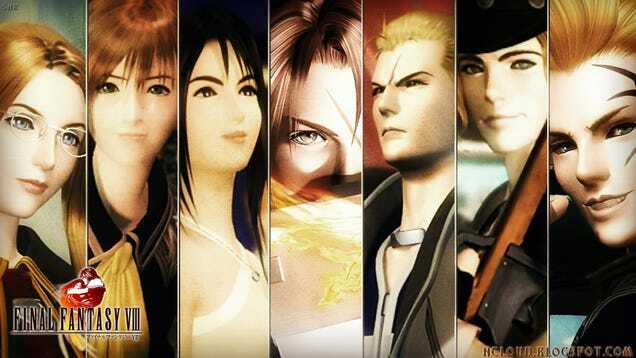 After you progress more, you find out that Squall is a 17 year old child soldier apart of this group called SeeD charged with protecting the world from Sorceresses in Balamb Garden. One of three Gardens apparently. That brings me back to one of the most memorable themes that I have for the game which is the Balamb garden theme. There was many a day as I was trying to figure out the junction system XD that I would hear this theme and it brought me joy each minute. And then of course, since this was my first JRPG, I was lost constantly on the world map for the first few hours. My next favorite themes were Blue Fields Theme as well as the Battle theme because random encounters became my life. Until you find out many years later that all the enemies scale with you so you can pretty much beat the game at lvl 20 if you so desired, RIP. The journey continues a bit more and we find out Squall and his friends need to pass the SeeD exam for their first mission and after that we meet the main female protagonist, Rinoa, at the SeeD ball. This is where they share one of my favorite scenes to Waltz for the Moon. In this scene you get to see how aloof and awkward Squall really was and how pushy and confident Rinoa was. However, you find out later that SeeDs are trained in ALL things (hue hue :3) so Squall eventually pulls it together in the end before Rin goes and wanders off. Another one of the last songs I found very magical was from the parade in Deling City. Fithos Lusec Wecos Vinosec played prominently during those scenes and managed to heighten my overall awareness of how dangerous this mission that the SeeDs were embarking in actually was. The sorceresses in this game are the primary antagonists and definitely changed my outlook on them from a fantasy perspective. Their stories are rather tragic in this game and all of their themes seemed to illustrate that the more you played. Like one thing is that a sorceresses power can never “die” with them and must be passed along. That whole thing is almost the major plot point for this whole game. So before this drags on too long I’ll get to the end. My last favorite song has to be Eyes on Me by Faye Wong. It is featured in a few places in the game but I will say that my favorite placement has to be the ending credits. **Fair warning though, do not click on the first video because it is the very ending credits. You have been warned. ** The second one is safe though. And truly the last song that I will share is the victory theme for FF8. It’s not an FF game without right? I hope you enjoyed through Final Fantasy 8 with me. What were some of your favorite songs for this game if you have them? What feelings did you get when you played? Let me know in the comments.